The Big Question: Can Dogs Actually be Trained to Alert to Seizures? We are very aware that most of what used to be said about Seizure Alert Dogs opposed this idea… but we have always disagreed – in fact, we’ve proven our methods… over, and over again. Little Angels is the proud leader in this industry when it comes to actively training dogs to alert to seizures. We developed the method that works and we will never hide our secret, because this knowledge is not something that should be hidden. We’ve been sharing our methods with other programs and trainers for years, and we love to see how many can be helped when others adopt our training methods. There is no greater goal than changing someone’s life through a highly trained dog, whether that dog comes directly from our program or not. In years past internet posts stated that only certain dogs ccould alert to seizures; that it is something they do naturally and they cannot be taught to perform this miracle. This was said about diabetic alert dogs as well – until someone discovered the miracle of scent training! The dogs who alert naturally to seizures are the dogs that care; these dogs are distressed that their beloved handler is having a seizure. Why do they care, you ask? Because they are naturally anxious dogs by breed and personality. Many of these dogs are displaying outward signs from their distress of knowing their handler is about to have a seizure, such as barking, whining, pacing, clinging to their handler, etc. 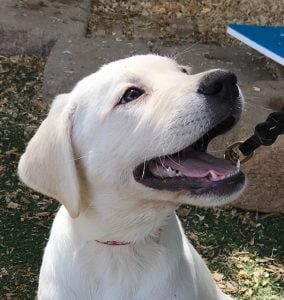 ; but many other dogs are alerting in their own way by yawning, licking their paws, or hiding in another room, all of which are all also signs of distress from a dog. It is just that in many of these cases, the handler would never put two and two together; that their dog is licking its paw 20 minutes before every seizure, for example. But in the hopes that the dog will naturally alert in a visible way, trainers will hand-pick dogs who are naturally anxious, hoping that the dog will inadvertently alert the owner before the seizure occurs. We do not believe that only anxious dogs can sense seizures – we believe that ALL dogs can sense them, it’s just that not all of them care. So how do we get them to care? Our trainers will only play “the alert game” when we have a scent sample of the seizure which the recipient mails to us before they get their dog. With practice and repetition from our trainers the cue for ALERT changes from us verbally commanding the dog, to the scent of the seizure. Soon the dog starts to paw at our leg with the scent alone. Then when the disabled recipient comes for Handler Training, we show them how to play “the alert game”, and we make certain the dog loves playing it with their new handler…then we cut off the game. We instruct the disabled recipient to only play the game right after they are recovering from a seizure. Pretty soon the dog realizes that the only time they get to play this amazing game is when their handler has a seizure, and that scent is present. The dog senses the chemical changes in their handler’s body – they pick up the scent – they know a seizure is about to happen – they know the game is about to happen, and they come over and paw at their handler’s leg to play the game. We truly hope that more trainers pick up on this. We won’t care that they are using our techniques – after all, we are here to help as many people as possible. There are many different types of seizures. Some seizures, such as many temporal lobe seizures, build gradually, with seizure activity building slowly over time. This allows an advanced warning system for a dog to recognize a scent cue and alert in advance before the seizure “breaks through” with the visible signs of a seizure. Some seizures, such as many frontal lobe seizures, strike quickly like lightening and many do not have a gradual increase of seizure activity. In some of these cases, with frontal lobe seizures, it is impossible for a dog to alert in advance because there is no advanced seizure activity within the brain that the dog can detect – but dogs can still be taught to alert during the seizure which can assist in the form of the dog alerting another household member of their recipient’s seizure. Many detailed factors come into play which can determine if a dog is able to alert in advance of a seizure, or during a seizure. Every case is different based on the types of seizures the disabled party experiences, how often these seizures occur, and when these seizures occur. We will need to speak with you and your neurologist to have a full understanding of your seizures. This allows us to determine what is possible, to make sure you have a realistic expectation of how a dog can assist. Our dogs are also trained to assist after a seizure. This is often called ‘seizure response’ training. They are trained to locate and retrieve a phone for their handler to call for help if needed, or even to dial a specialized assistance dog phone so the dog can call for help while their handler is unconscious during the seizure. Dogs are also trained to help brace or balance their handler for stability after a seizure, retrieve medication, provide deep pressure therapy, or in certain cases recipients will ask that the dog be trained to retrieve a family member in another room. Because of our alert game, we can train the dog to alert a parent that their child is going to have a seizure. No more worrying! It is such a relief for parents to know when their child will have a seizure. Is a Little Angels Seizure Assistance & Alert Dog Right for Me? Have seizures more than once a month on average in order for the dog to experience them often enough to learn and recognize them. 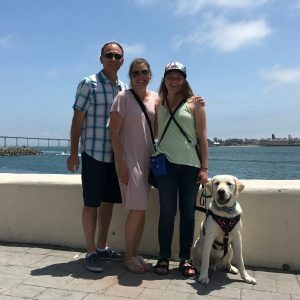 Seizure Assistance & Alert Dog? Submit a personal referral and medical documentation: If your initial application looks like a good fit we will reach out and ask for these documents. Handler Training: During handler training we work with you, one-on-one and show you how to reinforce the training your dog has already had. Once you and your dog graduate our program we stay in daily contact for the first month, followed by monthly, and bi-yearly consultations for reports on your dog’s ability to continuously provide assistance to you and your child. Click HERE for testimonials about our Seizure Assistance Dogs!